Amber Rose has announced that she and her boyfriend, Alexander "AE" Edwards are expecting their first child together. The model took to Instagram to announce the news while sharing a photo of herself at receiving a sonogram. "@ae4president and I are SUPER excited to announce that we have a Sweet little Baby Boy on the way! P.S Sebastian issoooooo Happy to be a big brother!" She wrote on Instagram. 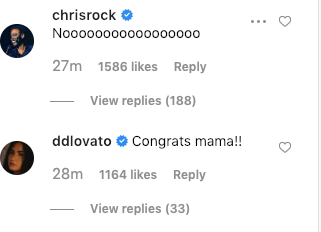 Her comments were filled with excitement from her fans and her friends, although Chris Rock seemed to be a caught off guard with the news, commenting, "Nooooooooooooooooo." However, Joseline Hernandez, Demi Lovato, and many others were quick to congratulate Rose for her pregnancy. Edwards also took to Instagram to share the news with his father, also sharing his excitement at the news that they're expecting a boy. Amber and Edwards, who's the Vice President of A&R at Def Jam, have been dating for the past few months. Reports that they were a couple first surfaced in October after her short-lived relationship with Monte Morris.